BenGlassLaw helps people like you make smart decisions about their legal issues. The best thing you can do is reach out to us directly to talk about your problem, but you may want to start by finding the best section for you below and clicking on it. BenGlassLaw's goal is to push for a true systemic change in our criminal justice system one case at a time. Learn about the long-term disability claim and appeal process. We’ve packed Don’t Try this at Home with a ton of useful information! 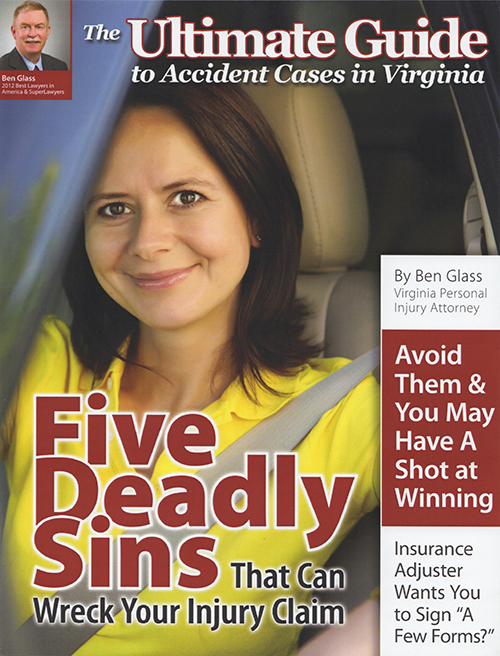 Crucial information for Virginia car accident claimants: a free PDF of attorney Ben Glass' book, Five Deadly Sins. 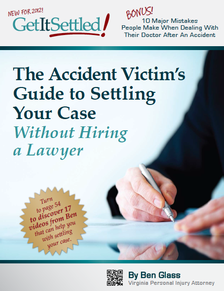 Learn how to settle your own case with this free PDF download of Ben Glass' book, Get it Settled. 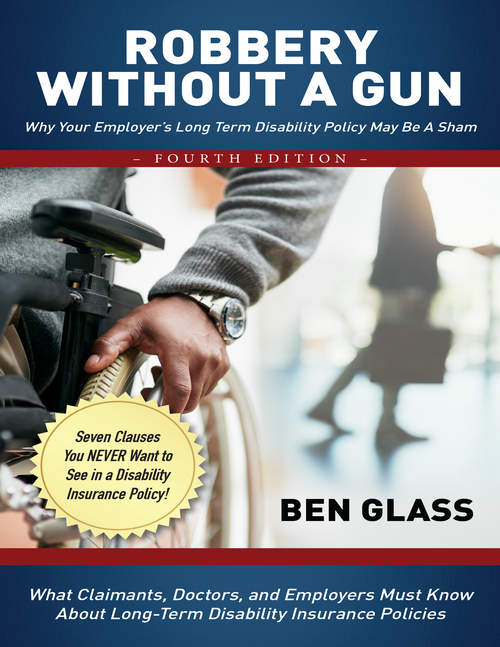 What Claimants, Doctors, and Employers Must Know About Long-Term Disability Insurance Policies: a free PDF download of Ben Glass' book, Robbery Without a Gun. but We Are Here to Help You! 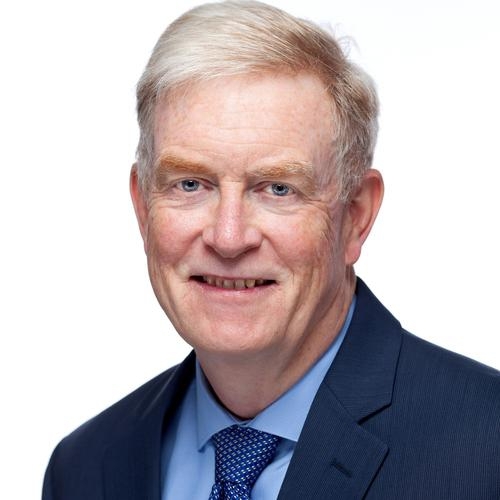 BenGlassLaw is dedicated to educating Virginians about personal injury, long-term disability, and insurance appeals cases so they can hire an attorney with confidence. We believe in "giving away" our legal knowledge, enabling people to make the best choices for their case. Before you talk to an adjuster or sign any forms, browse our library of FREE books and articles about personal injury, long-term disability, and insurance appeals claims. "Does my last day of work affect my long-term disability claim?" The day that you stop working is an incredibly important factor in your long-term disability claim. You'll ultimately have to justify this decision to your insurance company. "Should I apply for Social Security Benefits and Long Term Disability Benefits?" If you are disabled, you can apply for both social security and long-term disability benefits. If you are approved for social security benefits, you may be required to pay back your long-term disability company. "Should you hire an attorney for your first long-term disability appeal?" Some can file their initial appeal successfully, while others should consult with an attorney first. 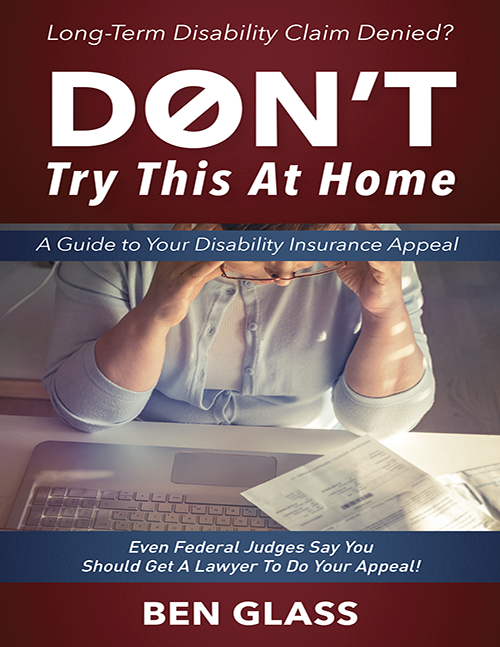 For more information, you can download Don't Try This at Home, my free guide on long-term disability cases. "Why are long-term disability benefits usually denied?" There are two main reasons an insurance company would deny your claim. 1) You do not meet the conditions for being disabled as defined in your contract or, 2) You are a victim of a frivolous denial of your claim. BenGlassLaw has offices to help you with your case in Fairfax, Richmond, Virginia Beach and Williamsburg. Representation in jurisdictions where we are not already licensed is performed in conjunction with local counsel–at no additional legal fees to the client–and with permission of the court. "Thanks Ben, you are not like the attorneys they talk about on TV... thank you for this information." Remember, when you order one of our consumer information packages (on injuries and car accidents, Virginia worker's compensation, or long-term disability), you get a FREE, no-obligation mailing right to your door with the tools you need to make smart choices about your case. Plus, you'll get our non-boring, non-lawyer-like consumer newsletter (it's got a great monthly recipe column), all of which is designed to make you a smarter consumer BEFORE you talk to that adjuster, hire a lawyer or sign any forms. 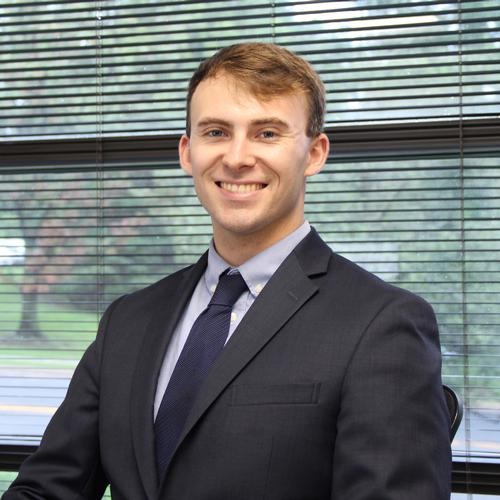 You can always call our main office in Fairfax, VA, and speak to one of our assistants to arrange an appointment with one of our attorneys by calling 703-584-7277. We can help you with settling a Virginia car accident case, appealing your insurance claim, reinstating disability benefits after being denied or terminated, and more. This is your case. My job is to make sure you have all the information necessary to make a great decision about your case. When you order one of our consumer information packages (on injuries and car accidents, insurance appeals, or long-term disability), you get a FREE, no-obligation mailing right to your door with the tools you need to make smart choices about your case. Plus, you'll get our non-boring, non-lawyer-like consumer newsletter (it's got a great monthly recipe column), all of which is designed to make you a smarter consumer BEFORE you talk to that adjuster, hire a lawyer or sign any forms. The BenGlassLaw team exists to assist. 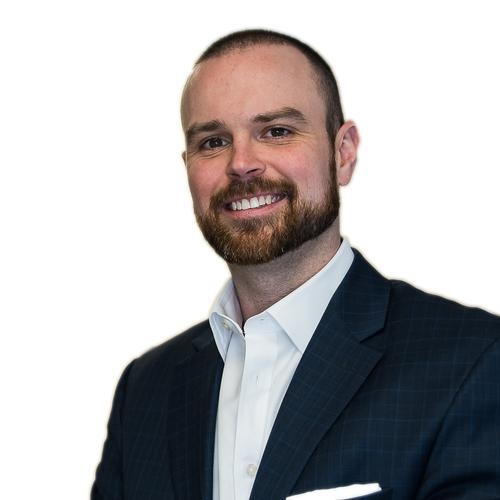 We have numerous free materials that Ben has created simply to educate people that might have a legal issue; including books on car accidents, medical malpractice, long-term disability, and how to hire an attorney. We give these reports, books, and videos away freely because we have an "abundance" mentality. We want to give as much as possible so that people know that we are truly here to assist them. This is your case and your life. We are here to help you make the best decision possible, given your unique legal situation, but nothing happens without your approval and you are kept in the loop 100% about the status of your case. We are here to serve you, period. We hate the stereotype that lawyers have in this country and we've made it our personal mission to shatter people's assumptions. We believe that you deserve a lawyer and a legal team that is honest, authentic, and ethical. We don't move forward unless we believe with absolute certainty that it is the right thing to do. Respect is a two way street. We treat every person that calls our office with the same respect and dignity that we would give a personal family member. If you're our client, you're a member of the extended BenGlassLaw family. This applies not only to our communication with our clients but our communication with each other. We are a tight-knit group that's committed to getting our clients the best possible results for their case. that means that all parties involved have to be honest, forthright, and keep no secrets from each other. You will be kept up to date on every aspect of your case as it develops. Free educational materials are the foundation of BenGlassLaw. We believe that everybody, whether they hire us or not, deserves to understand their legal situation without having to pay for it. Ben has written over a dozen books and consumer guides and offers them for free. If you'd like one of our free books, please call! We love to give this information away. We're all Virginians, too, and we want this state to be the safes and most educated state in the country. We are good at what we do. Virginians deserve an attorney who is honest, hard-working, and experienced in the Virginia court system. We've been defending clients successfully and fighting for their rights since the day we opened our doors and that will never change. Many of our clients come to us at one of the worst times of their life. They've been in a car accident, they received improper medical care, or their long-term disability claim has just been denied by the insurance company that they've been paying for decades. People who have been injured and are in pain deserve a law firm that treats them as a person and not as a point on the data sheet. We will never stop finding new ways to help our clients and defend them. We only hire members for our team who have made a life-long dedication to improving themselves and helping those around them. If you're looking for a law firm to broker shady deals, keep you out of the loop, and tell you only what you "need to know," we are not the right fit for you. We believe in integrity, sincerity, and professionalism in everything that we do. We are the right law firm for a person that has been wronged and needs a trusted ally to guide them through the legal process. We recognize that we're not the right law firm for everyone out there, but that doesn't mean we can't assist them in some way. We're always happy to send out our free materials to consumers and if we don't handle the area of law that you need, we have trusted attorney friends that we can refer you to. If you're facing a legal matter, we are ready to provide answers to your question (703) 584-7277.